What a gem! 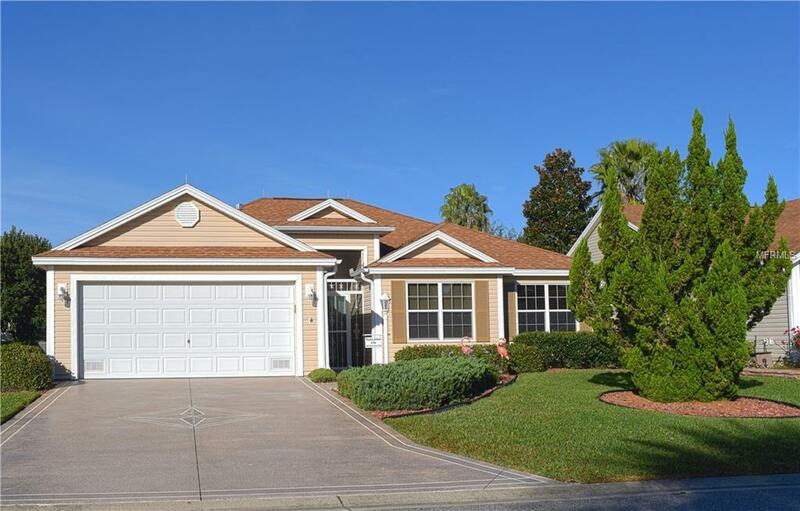 This lovely EXPANDED OLEANDER/HAWTHORNE DESIGNER 3/2 is centrally located in the VILLAGE OF POINCIANA.This beautiful home is close to both SEABREEZE and LAKE MIONA REC CENTERS and just a short golf cart ride to LAKE SUMTER LANDING which makes it the perfect location! This home features a large living room with volume ceilings, tile flooring and custom window treatments throughout. The front bedrooms are EXPANDED by 2 feet, the enclosed acrylic WRAP AROUND LANAI has painted floors and includes sunshades...a great place to sit and enjoy your morning coffee. The kitchen features GRANITE counter tops, a center ISLAND, SOLAR LIGHT TUBE, tile back splash, OAK CABINETS, pantry closet, TILE FLOORING and a reverse osmosis WATER FILTER (under sink). There is also a whole house WATER FILTER in the garage. The master bedroom features a TRAY CEILING, his and her WALK-IN CLOSETS, an en-suite bathroom w/WALK-IN SHOWER, his and her sinks, GRANITE counters and separate toilet room. The 2 car garage features a roll up PRIVACY SCREEN. LIGHTNING RODS have been installed for added safety and extra insulation has been added to help save on your utility bills! A new water heater was installed in 2016. DON'T MISS OUT ON THIS BEAUTIFUL, IMMACULATE HOME IN THIS VERY DESIRABLE LOCATION!! BOND BALANCE is $8,536.24.